7. Standard or non- standard Sprockets according to American and European standard & DRAWING. 1. Hangzhou Vision Chain Transmisison Co ltd. is UK- Investment Chain manufacture in Hangzhou, China. founded in 2004. 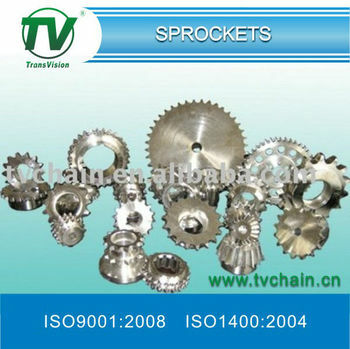 We have one Chain manufacturer and one Sprocket manufacturer. 2. Qualified Alloy steel chain put our TV brand chain in the top quality level in China. We are honoured with ISO9001.ISO14001.AAA Credit certificate. 3. We have been producing all kinds of standard sprocket and special sprocket: Stock Sprocket, Platewheels, Finished Bore Sprocket, Taper Bore Sprocket, Cast iron Sprocket, Single Stainless steel Sprocket, Idler Sprocket, Weld-on Sprocket, Hub and so on.